Begin your practice with our free Unique Word Sample Questions seen on a typical Prove It Microsoft Word Assessment. These will cover the full range of questions and topics you may face on the real test day. Looking for a complete practice experience? look at our full Kenexa Word Test Preparation. Below are free sample questions similar to the questions seen on a typical Prove It Microsoft Word assessment. For both interactive and multiple choice questions, our products offer the ability to practice with software similar to the one used by Kenexa. After completing the questions, fill in your details. A file with step-by-step solutions will be sent to the email provided. Below is a selection of sample questions similar to the Kenexa questions you might face on your Kenexa test. To get a real full preparation for the Microsoft Word Exam, simply click Get The Full Preparation Pack below. Many companies require their candidates to take a Microsoft Word assessment test as part of the recruitment process. This product often includes other MS Office applications, such as Excel. 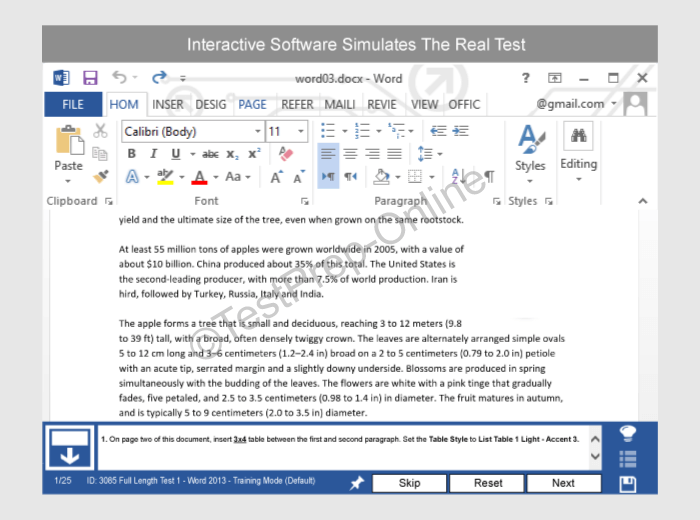 The Microsoft Word tests measure your ability to complete tasks in Microsoft Office Word software at various levels. This assessment can either be formatted as a multiple-choice test or an interactive test. Copy and paste the contents of the text box below to the top-left corner of a new Word document. In order to practice the following tasks, copy and paste the text on the top-left of a new Word document (left click and hold, drag to mark the entire text, right click and choose copy. Open a new Word document, right click and choose paste. Alternatively, you can press Ctrl+V). Add numbering to the "Students" and "Teachers" lists separately. Change the layout of the "Students" list into two columns. Create an "Annual Style" header. Record a Macro that will apply yellow highlighting. Name the macro: "Approved," and assign it the shortcut "Alt+k." Insert a Bookmark next to the "Attendance List" title. Name it "Title." Add the word "Back" below the list, and make it a Hyperlink to the "Attendance List" title. Change the document settings to show Readability Statistics. The answers to the interactive questions and the multiple choice questions appear in this PDF file. Which of the following methods you CANNOT use to zoom in? I want to create a second copy of an opened document under a different name. What should I do? What does a blue “wavy” underline appearing under a word mean? In the following picture, what do'es the numbers stand for? Click below for the 2016 Kenexa Prove It Microsoft Office Word test, to get the full preparation for the Word Exam.